If you wish to avoid the crowds during you vacations in Side and you are also a nature lover, then Side Green Canyon Boat Trip is the ideal option. 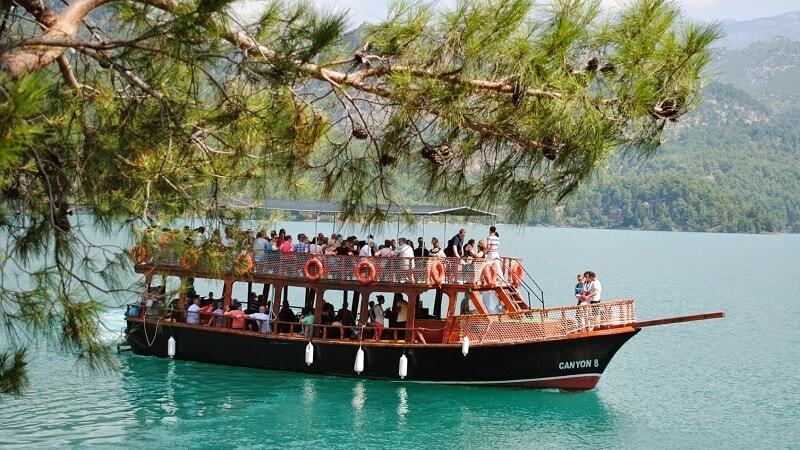 This excursion will set your mind free as you will be traveling through the turquoise waters of the Green Lake. Relax and enjoy your time surrounded by the unique beauty of nature and create long-lasting memories with this alternative experience. Side Green Canyon Boat Trip starts by the moment when our comfortable and modern vehicles pick you up from your hotel. The driver will drive you towards the first stop of this excursion. At the dam lake of Oymapınar a short break will be given. 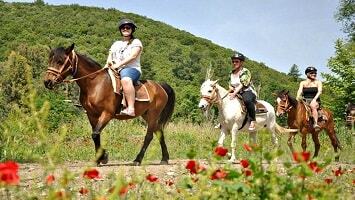 There you will have the chance to admire the natural scenery. 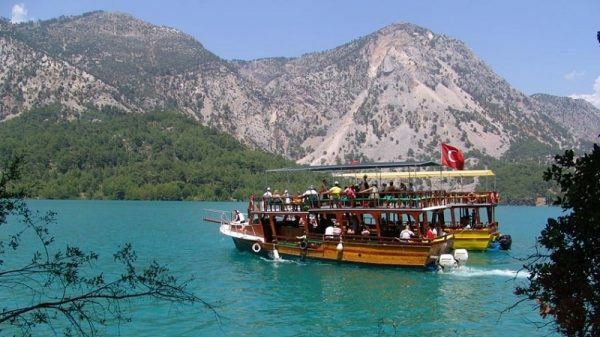 The area of Side-Manavgat has some unique spots of natural beauty. The particular location is definitely one of them. 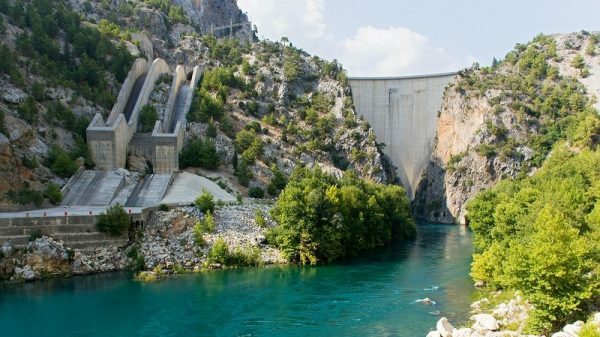 It is important to mention that Oymapınar Dam is the fifth largest dam in Turkey. In fact, it is capable to meet the needs of electricity and water supply of the region. In addition, you will be able to see a 2000 years old bridge that dates back to the Roman Period. Make sure that you will snap some amazing photos of this spot as it is an outstanding landscape. From there, the boat trip experience starts. A 14Km route with the boat is scheduled and during the time of your boat trip, you will be amazed by the beauty of the surroundings. Every spot and every view will be the ideal scenery for a breath-taking photo. After two hours on the boat, a short swimming break will be given. Get the chance to revitalize yourself and your senses by swimming in the emerald waters of the lake and admire the natural settings. The boat continues towards its next stop for a lunch break. At a lake-side restaurant, the menu will include barbecued chicken, meatball or fish, pasta, salad and fruit. From the restaurant you will enjoy some spectacular views over the lake. In addition, after the lunch you can spend your time with some lake activities. The restaurant offers equipment for fishing and canoe. Alternatively you can just relax and admire the natural setting of the lake. After the long break, the boat will sail again towards the pier where the trip started. Once you reach the pier, vehicles will be waiting for you. Side Green Canyon Boat Trip ends by the time you reach your hotel. 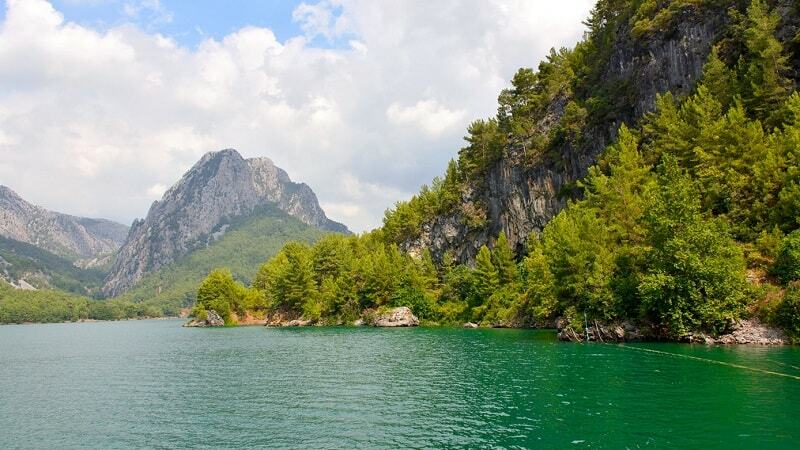 Set your mind free and give yourself the chance to relax with a boat trip in the Green Canyon. 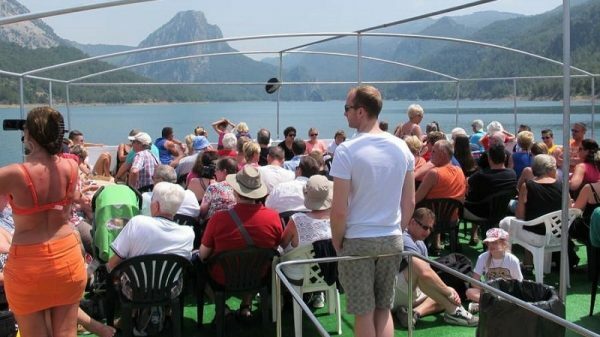 This unique excursion offers stunning views over the Green Canyon and a relaxing atmosphere on a boat. A combination of adventure and peaceful scenery is what you should expect. Swim in emerald waters and revitalize your senses with the unique opportunity that Side Green Canyon Boat Trip offers. Your exploration of the Green Canyon starts in the morning, when comfortable and modern vehicles pick you up from your hotel. Out team members will drive you towards the first stop of this trip. 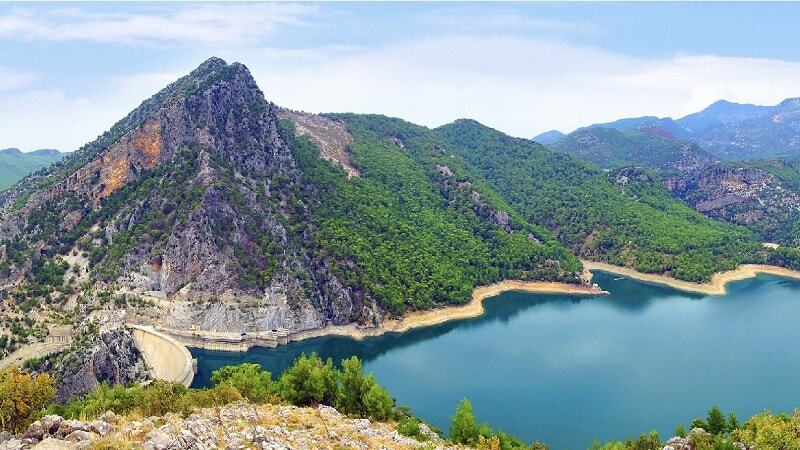 At the dam lake of Oymapınar a short break will be given. 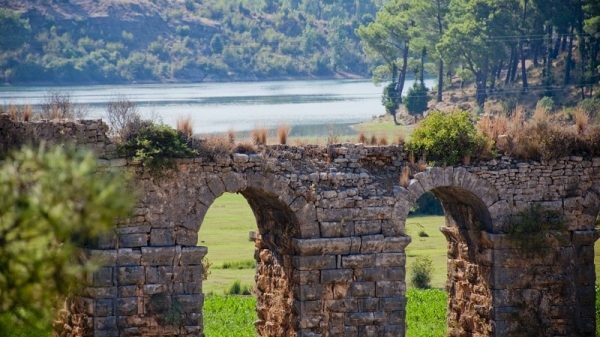 It is not a coincidence that the region of Side-Manavgat is characterized as an ideal location for beautiful landscapes and natural wonders. The Oymapınar Dam is the 5th largest dam in Turkey and operates to meet the needs for water and electricity for the region. Except form the amazing landscape, at that spot you will be able to see an ancient bridge. 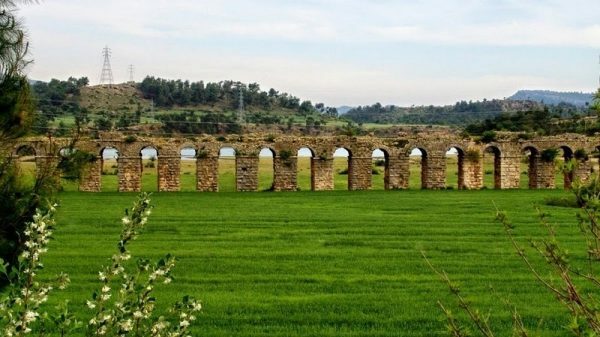 The particular bridge is 2000 years old and dates back to the Roman Period. Once you take some stunning pictures, the real adventure starts. You will be cruising in the Green Canyon for a 14Km route. 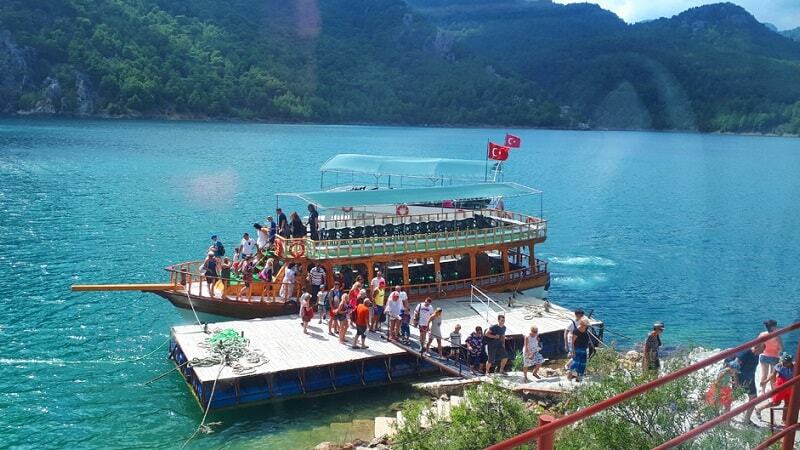 Enjoy the boat trip and some magnificent views of the Green Canyon. This part of the excursion is ideal for those who wish to relax and for those who wish to snap some pictures of a stunning landscape. After two hours of cruising in the lake, a short swimming break follows. The turquoise waters of the lake will make your experience memorable, as you will be swimming surrounded by the beauty of the nature. Revitalized and refreshed from the swimming you will continue the boat trip towards your next stop. At a lake-side restaurant a long break will be made for lunch. The menu includes barbecued chicken, meatball or fish, pasta, salad and fruit. Once you enjoy the tasty lunch, you can spend your free time as you wish. For those who wish to relax, you can swim in the lake and admire nature. However, if you are seeking a more adventurous activity, then you can make use of the restaurant’s equipment for lake activities. The restaurant provides equipment for fishing and canoes. By the end of your break, the boat will sail again on its way back towards the pier where your boat trip started. Once you reach the pier, our comfortable vehicles will be waiting for you. This unique excursion ends by the time you reach your hotel. Side Green Canyon Boat Trip is the ideal way to spend you day away from the crowds and enjoy spectacular natural settings.